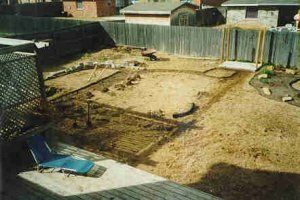 This page will supply tips I learned from building my first pond and applied to building my next ones. THEY ARE NOT IN ORDER OF IMPORTANCE!! I will use pictures from that process as necessary. I will also include tips from others on the net so if there are some things that really helped you, let me know and I will include them here with your name and address. Send pictures of your tips too if you have them. Tip 14: When you do ANY outside wiring, PLEASE USE GROUND FAULT CIRCUIT INTERRUPTER OUTLETS OR BREAKERS. GFCI outlets and breakers will trip MUCH faster than normal breakers and are a requirement in most codes for any outside outlet or any outlet that is in close proximity to water. Tip 15: If you use a submersible pump, you will lengthen the life of your pump and reduce the chance of a pump barf if you attach a sacrificial anode to your pump. Any metal pump will corrode in water due to the electrical field that is generated by the water running thru the pump and plumbing. Since the weakest metal will corrode first, a sacrificial anode which is made of very soft material, will corrode before the pump parts. This has eliminated the leaks from my Little Giant 6ECIM pump that has been running for 3 years that everyone else has seen with these pumps. Tip 16: If you run into a situation where real rocks just will not work, or you need support for some real rocks, say for a waterfall, you can make fake rocks like you have seen in the water parks and putt-putt courses. The form is first shaped with the re-bar. Use pictures of real rocks to give you some shape ideas. Next attach the wire lath. This is the lath that is used for stucco work. Wire it on very solidly to the INSIDE of the re-bar form. Wire standard chicken wire to the outside of the re-bar. If the structure is solid enough to walk on, it is sturdy enough. Mix the concrete very dry. 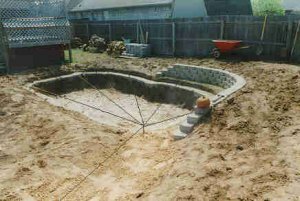 If you do not use pre-mixed, use 30 shovels of sand to 1 bag of cement. If you use premix bags, use sand mix, not mortar. The mix should be very dry because you don't want it to run and creep. As with any concrete, drier mixes are usually stronger. Trowel on the first layer. 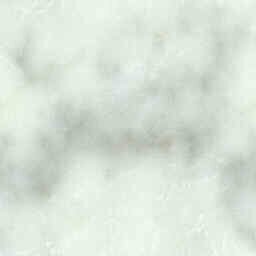 The sample I saw had only 2 layers and the first was about 3/4 inches thick. Only mix as much as you can work comfortably. If you have some areas that hang upside down, you might want to rough up this section for the next layer to stick. Let this layer dry at least 24 hours. 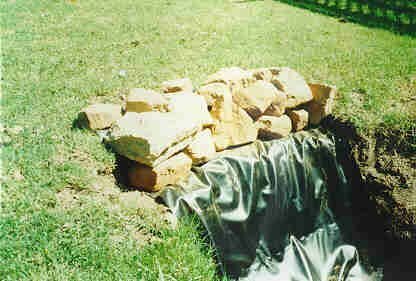 If you are constructing a waterfall, you can lay your liner on top of the first layer. Then cover the liner with a layer of chicken wire because layer 2 will not stick to the liner. Mix concrete for layer 2 like you did for layer 1. Once you get a section laid, rip off strip of heavy duty foil and spread over the area you just laid and, using a wet sponge, wipe the foil against the fresh concrete. Don't laugh, as the foil conforms to your shape, it will wrinkle, fold and whatever. This will give your "rocks" a more natural texture. If you leave the foil on the rock, you won't wash away the concrete you just laid when you foil the next section. After you remove the foil, use trowels, brooms, brushes, branches, whatever to put in the cracks, and textures you see in natural rocks. The professionals use molds from real rocks for this. Tip 17:Many people think about using fresh water mussels to help them with their filtration. I'm not a big fan of this technique. Don't get me wrong, it works, but there are better ways to do this. Mussels shoot eggs into the water to spawn. These eggs will end up in the waterways everytime your pond overflows. Nature doesn't need them. 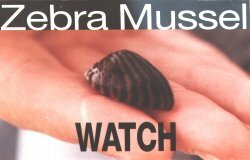 As an example, the zebra mussel. These things made it into the Great Lakes as ballast in a cargo ship. They have no natural predators here. They were first detected in 1988 and now they're everywhere posing a multi-billion dollar threat to agriculture, shipping, municipal water supplies, utilities. They attach themselves to everything and you almost need to blast them off. Take a good look at this picture. If you find them anywhere, don't throw them back into the water. Store it in alcohol and IMMEDIATELY call the Alabama Sea Grant Extension Office at (334) 438-5690 (e-mail zebra@acenet.auburn.edu) or the Missippi Grant Advisory office at (601) 388-4710. They're turning up all over the place. I have even heard of a siting in a pond. Tip 18: I don't use dechlorinator anymore. They don't REMOVE the chloramines/chlorine/ammonia. What they do is break the chlorine/ammonia bond. The chlorine then evaporates and the ammonia is converted by your biofilter into fertilizer. What that means is that every time you add water and add this stuff, you are asking the gods to present you with a nice algae bloom. This is even more of a problem for those people who INSIST on doing regular water changes. The more water you add, the more fertilizer you are releasing. But you have to get rid of the chloramines or kill your fish. 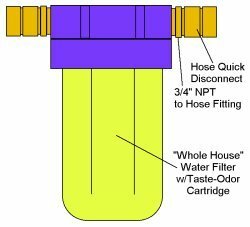 I do this with a filter I built from about $30 in parts, about the cost of a couple bottles of "dechlorinator". It starts with a "whole house" filter. It's like those you may have under your sink but is has 3/4 inch fittings, not 1/4 inch. To those openings, attach brass or plastic fittings that go from hose to pipe. Your plumbing dealer can help find the fittings. I use brass fittings because I also attached "quick disconnect" fittings. When you make up all your connections, use teflon paste, not teflon tape. The cartridge you use will be a "taste/odor" cartridge. They come in 2 different types. One has a wire mesh around it and you can see the charcoal in the filter, the other uses a membrane. It is the second one you want. 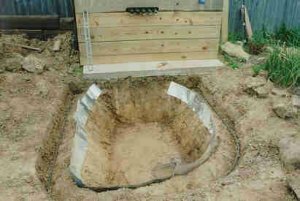 I replace 2 to 4 inches of water from my 12x22 and 6x8 ponds every week during the summer and I only replace the cartridge twice a year. 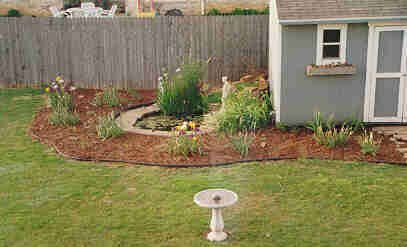 Not only do you not have to add chemicals to your pond with this method, it saves you money in the long run!